samantha shade design: July 7th? Just wondering right about now where summer is going? Time is flying by and I have not been a good blogger, lol!! I have been trying my best to keep my girls busy which means lots of time away from this computer and more time at our pool! I wanted to share with you my current listing on ebay... switching it up a bit... instead of the usual scrapbook or scrapbook page I made a scrapbook canvas :o) It is just a bit more sturdy than a page and would easily sit in an easel or could be placed on a shelf to display. 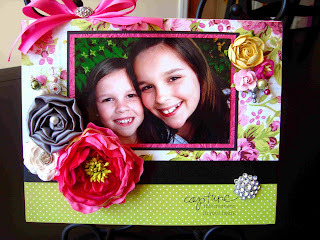 I am in love with all the vibrant colors in this paper from Girls Paperie and that beautiful pink blossom from Prima (my last one that I have been hoarding, hehe). Anyway, you can check the listing out here and see all the pictures! Just finished two custom albums recently for a dear lady and I have one more to make for her next week. 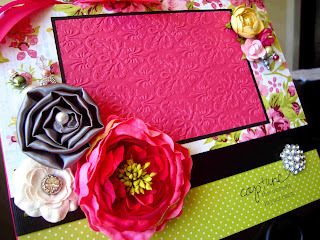 I am working on a new album for ebay right now using Pink Paislee's Butterfly Garden paper... soft shabby chic colors -- gorgeous, gorgeous paper! I am hoping to list that early next week, keep watching!! And remember you can see my listings and all the other fabulous listings from the girls in my design group by typing TWAG in the ebay search bar! !